Not to be confused with Enneads. Roman bas-relief, 2nd century: Aeneas lands in Latium, leading Ascanius; the sow identifies the place to found his city (book 8). Virgil, holding a manuscript of the Aeneid, flanked by the muses Clio (history) and Melpomene (tragedy). 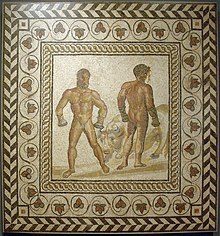 Roman mosaic, third century AD, from Hadrumetum, now in the Bardo Museum, Tunis. In 1791 the Russian poet N. P. Osipov published Eneida travestied [ru] (Russian: Виргилиева Энеида, вывороченная наизнанку, lit. 'Vergil's Aeneid, turned inside out'). ^ Magill, Frank N. (2003). The Ancient World: Dictionary of World Biography, Volume 1. Routledge. p. 226. ISBN 1135457409. ^ Gaskell, Philip (1999). Landmarks in Classical Literature. Chicago: Fitzroy Dearborn. p. 161. ISBN 1-57958-192-7. ^ "History of Latin Literature". HistoryWorld. Retrieved December 5, 2016. ^ Aloy, Daniel (May 22, 2008). "New translation of 'Aeneid' restores Virgil's wordplay and original meter". Cornell Chronicle. Retrieved December 5, 2016. ^ Damen, Mark (2004). "Chapter 11: Vergil and The Aeneid". Retrieved December 5, 2016. ^ Gill, N. S. "Why Read the Aeneid in Latin?". About.com. Retrieved December 5, 2016. 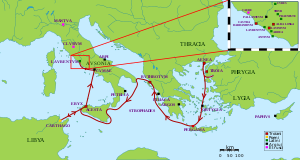 ^ The majority of the Odyssey is devoted to events on Ithaca, not to Odysseus' wanderings, so that the second half of the Odyssey very broadly corresponds to the second half of the Aeneid (the hero fights to establish himself in his new/renewed home). Joseph Farrell has observed, "... let us begin with the traditional view that Virgil's epic divides into 'Odyssean' and 'Iliadic' halves. Merely accepting this idea at face value is to mistake for a destination what Virgil clearly offered as the starting-point of a long and wondrous journey" ("The Virgilian Intertext", Cambridge Companion to Virgil, p. 229). ^ Publius Vergilius Maro (2006). The Aeneid, translated by Robert Fagles, introduction by Bernard Knox (deluxe ed.). New York, New York 10014, U.S.A.: Viking Penguin. p. 26. ISBN 978-0-14-310513-8. ^ Glazewski, Johanna (1972). "The Function of Vergil's Funeral Games". The Classical World. 66 (2): 85–96. doi:10.2307/4347751. JSTOR 4347751. ^ Sellar, William Young; Glover, Terrot Reaveley (1911). "Virgil". Encyclopædia Britannica. 28 (11th ed.). p. 112. Retrieved 7 June 2012. ^ Pound and Spann; Confucius to Cummings: An Anthology of Poetry, New Directions, p. 34. ^ See Emily Wilson Passions and a Man Archived 14 September 2008 at the Wayback Machine, New Republic Online (11 January 2007), which cites Pound's claim that the translation even improved on the Virgil because Douglas had "heard the sea". ^ "Virgil:Aeneid II". Poetryintranslation.com. Retrieved 27 November 2012. ^ Hahn, E. Adelaide. 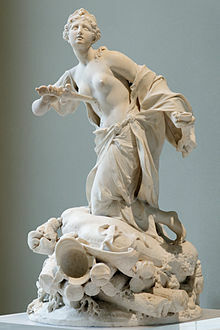 "Pietas versus Violentia in the Aeneid." The Classical Weekly, 25.2 (1931): 9–13. ^ McLeish, Kenneth. "Dido, Aeneas, and the Concept of 'Pietas'." Greece and Rome 19.2 (1972): 127–135. ^ Coleman, Robert. "The Gods in the Aeneid." Greece and Rome 29.2 (Oct 1982): 143–168; also see Block, E. "The Effects of Divine Manifestation on the Reader's Perspective in Vergil's Aeneid" (Salem, NH), 1984. ^ Duckworth, George E. "Fate and Free Will in Vergil's Aeneid". The Classical Journal 51.8 (1956): 357–364. ^ Fitzgerald, Robert, translator and postscript. "Virgil's The Aeneid". New York: Vintage Books (1990). 415. ^ Scully, Stephen. "Refining Fire in "Aeneid" 8." Vergilius (1959–) 46 (2000): 93–113. ^ Fitzgerald, Robert, translator and postscript. "Virgil's The Aeneid". New York: Vintage Books (1990). 407. ^ Hahn, E. Adelaide. "Pietas versus Violentia in the Aeneid." The Classical Weekly, 25.2 (1931): 9. ^ Pogorselski, Randall J. "The "Reassurance of Fratricide" in The Aeneid." The American Journal of Philology 130.2 (Summer 2009): 261–289. ^ Fitzgerald, Robert, translator and postscript. "Virgil's The Aeneid". New York: Vintage Books (1990). 412–414. ^ Grebe, Sabine. "Augustus' Divine Authority and Virgil's Aeneid." Vergilius (1959–) 50 (2004): 35–62. ^ Scully, Stephen. "Refining Fire in Aeneid 8." Vergilius (1959–) 46 (2000): 91–113. ^ Trans. David West, "The Aeneid" (1991) xxiii. 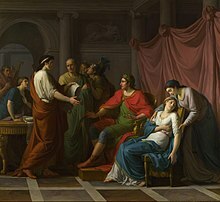 ^ The anecdote, in which the poet read the passage in Book VI in praise of Octavia's late son Marcellus, and Octavia fainted with grief, was recorded in the late fourth-century vita of Virgil by Aelius Donatus. ^ Kleinberg, Aviad M. (2008). Flesh Made Word: Saints' Stories and the Western Imagination. Harvard UP. p. 68. ISBN 978-0-674-02647-6. ^ Montaner, Carlos Alberto (2003). Twisted Roots: Latin America's Living Past. Algora. p. 118. ISBN 978-0-87586-260-6. ^ Horsfall, Nicholas (2000). A Companion to the Study of Virgil. Brill. p. 303. ISBN 978-90-04-11951-2. ^ Burman, Thomas E. (2009). Reading the Qur'ān in Latin Christendom, 1140–1560. U of Pennsylvania P. p. 84. ISBN 978-0-8122-2062-9. ^ Savage, John J.H. (1932). "The Manuscripts of the Commentary of Servius Danielis on Virgil". Harvard Studies in Classical Philology. 43: 77–121. JSTOR 310668. ^ Grafton, Anthony; Most, Glenn W.; Settis, Salvatore (2010). The Classical Tradition. Harvard UP. pp. 294–97. ISBN 978-0-674-03572-0. ^ Skinner, Marilyn B. (2010). A Companion to Catullus. John Wiley. pp. 448â??49. ISBN 978-1-4443-3925-3. 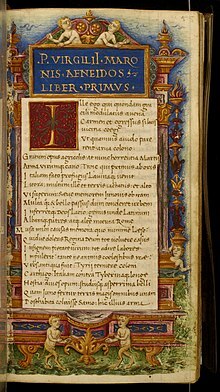 ^ "Latin : Virgil; Course Description" (PDF). College Board. 2011. p. 14. Retrieved 30 August 2011. ^ McGrath, F. C. (1990). "Brian Friel and the Politics of the Anglo-Irish Language". Colby Quarterly. 26 (4): 247. ^ "The Aeneid". V.I. Vernadsky National Library of Ukraine. World Digital Library. Retrieved 25 December 2013. ^ "Russian animation in letters and figures | Films | ╚ENEIDA╩". Animator.ru. Retrieved 27 November 2012. 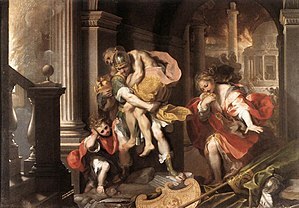 Wikimedia Commons has media related to Aeneid. 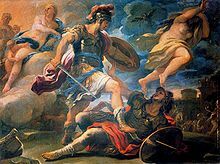 Look up Aeneid in Wiktionary, the free dictionary. This page was last edited on 12 April 2019, at 18:53 (UTC).